2007 Sealco International Ltd opened its gasket division, we stock a complete and versatile range of materials, including compressed non-asbestos fibre (CNAF), together with commercial rubber, neoprene, nitrile, EPDM, butyl, silicone, viton® and polyurethane sheet. Tooling is available to produce all standard pipe flange gaskets (BST, ASA, DIN etc.) from any material. Wound in V-section metal strip and a softer filler material. Support rings, inside and/or outside the spiral, improve the gasket’s handling, fitting and versatility. In operation, flange faces are presented with a spiral of alternate metal/filler layers. This sealing arrangement is highly successful on flanges where temperature, pressure, vibration or flow rates are beyond the capability of conventional jointing materials. Ring Type Joint (RTJ) Gaskets are precision machined, metallic sealing rings suitable for high pressure and high temperature applications. 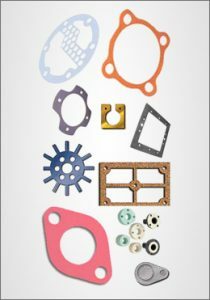 RTJ gaskets are designed to seal by “initial line contact” or wedging action between the mating flange and the gasket. These basic shapes are used in a variety of applications with pressures up to 20,000 PSI. The dimensions are standardized and require specially grooved flanges by where a corresponding “R” or “BX” number is assigned for pipe size and pressure class for gasket identification.